This is the last week for Territory women to get their nomination in for the 2019 AgriFuturesTM Rural Women’s Award, with applications closing at 10.30pm on Sunday 27 January. 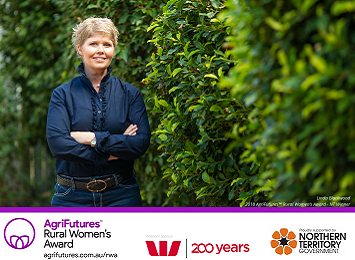 This award is open to all women involved in rural industries, rural and regional businesses, and rural and regional communities. It provides a platform to inspire Australian women to use their skills to benefit their industries and communities and is an amazing opportunity to further your leadership development, make a tangible difference and inspire others. Linda talks about how she came up with her winning project in a short video on the Department of Primary Industry and Resources website. The 2019 Territory winner will receive a $10,000 bursary for innovative projects, and access to professional development opportunities and the alumni network. Northern Territory applicants have until 10.30pm Australian Central Time on 27 January 2019 to nominate for the award. More information on the awards and how to submit an application is available on the Department of Primary Industry and Resources website. The AgriFuturesTM Rural Women’s Award is proudly supported by the Northern Territory Government and coordinated in the Northern Territory by the Department of Primary Industry and Resources.